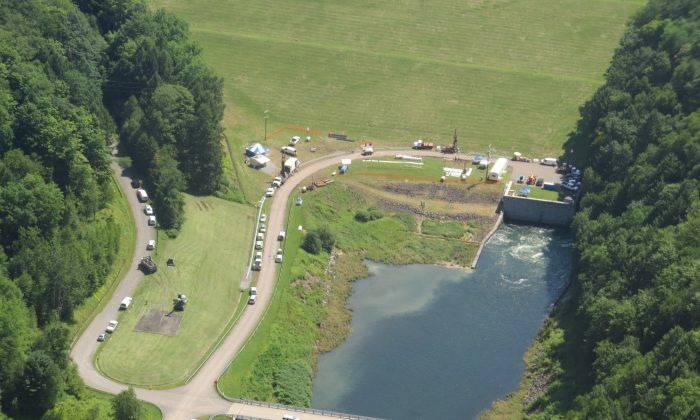 MATAMORAS—The remediation efforts to stem the flow of turbid discharge near the Cannonsville Dam in Deposit, about 90 miles northwest of Matamoras, are going well, the New York City Department of Environmental Protection (NYCDEP) said Tuesday. The agency held a meeting in Matamoras to inform people along the Delaware River of the progress they have made since a scare in early July. Workers drilling holes for a hydropower plant about 50 yards downstream of the dam hit a pressurized aquifer that poured sediment and water into the river. At first the agency was worried that the sediment was from a leak in the dam and started draining the dam just in case. Through testing, however, they quickly found out that the sediment was from the bore holes. To decrease the pressure of the water coming from the holes, they created relief wells, and on Aug. 2 reported that the sediment in the river had returned to normal. Next they sealed the holes with a hard grout to keep the water from coming back up, similar to putting a cork in a wine bottle. They are in the process of winterizing the wells so they can be used in the future if necessary and are still monitoring the area 24/7. “They [three geotechnical engineers] essentially declared today that it is 100 percent completely fixed,” said Adam Bosch, the director of public affairs for the New York City Watershed. The Cannonsville Reservoir, the youngest of New York City’s 19 reservoirs, flows into the West Branch of the Delaware River. It not only supplies drinking water for New York City, but can affect the drinking water in places Trenton, N.J. and Philadelphia because of its impact on the water levels in the Delaware River, Bosch said. The silver lining in all this said Paul Rush, the deputy commissioner of water supply for the NYCDEP, is that they know a lot more about the dam now. They have installed additional piezometers, which measure the pressure of the water around the dam, and will be using all the new info to weigh the cost benefits of a hydroelectric power plant there. Rush said the original projected cost of the power plant was around $70 million. “Over the course of the 50-year life of the plant, it was estimated to be just slightly positive on the long-term value analysis,” he said. To get more information, visit the watershed section of the nyc.gov website or on the NYC Watershed Facebook page.